Loved, loved, loved Samantha and Sam’s wedding cake! They’d already had their wedding in Italy (how amazing!) so had booked the gorgeous Little Channels, Chelmsford to celebrate with a huge party for family and friends. 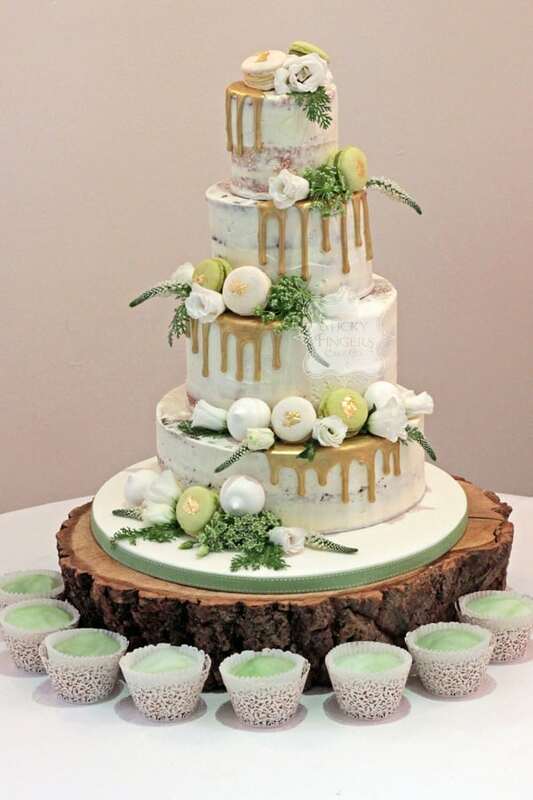 They chose a fresh colour scheme of white, green and gold so to decorate the cake I supplied white and green French macarons, meringues and fresh flowers and also made ganache to drip down the sides of the cake which I painted with an edible gold lustre. The yummy flavours were Carrot and Pecan, Lemon, Rich, Dark Chocolate and Strawberry and Champagne, lovingly surrounded by eight Vegan Vanilla cupcakes. Wishing you both many congratulations and wishing you love and happiness for the future!